According to leading research firm Futron Corporation  who prepared an outstanding Space Foundation Space Report 2011 (an executive summary of which appears later in this issue)  105 satellites were launched during 2010, bringing in approximately $10.55 billion in revenue. Companies are working diligently to offer SatCom and launch services to an increasingly hungry Asia-Pacific customer base. From satellite broadcasting to Earth Observation to navigation to government and military needs, this market segment is not only viable, but one that represents a great deal of growth potential for those involved in this segment. William Wade was appointed as Chief Executive Officer on August 1, 2010, to lead AsiaSat, and as of January 1, 2011, his title changed to President and Chief Executive Officer. Prior to assuming his new role as Chief Executive Officer, Mr. Wade had served as AsiaSats Deputy Chief Executive Officer for 16 years. Mr. Wade has over 25 years experience in the satellite and cable television industry. Prior to joining AsiaSat in April 1994, he was with Hutchison Whampoa, as Director of Business Development for Pan Asian Systems, and was in charge of all sales and regional operations. Mr. Wade also served as Executive Director for Echosphere International (Echostar), where he established Echospheres permanent Asian operations in Singapore while managing the companys activities in Asia and the Middle East. Andrew is the President and CEO of GE-Satellite. He has more than 20 years of experience in the management and development of new markets and products throughout Asia. He graduated from the School of Oriental & African Studies in London and started his career in sales, progressing into executive management roles in media and satellite businesses in Asia. Former roles include: Marketing General Manager (AsiaSat), Senior VP (PanAmSat) and Executive Director (Measat). Before joining GE-Satellite Andrew founded Loft Communications, as Managing Director, providing consultancy services to the Satellite, Television and Telecommunications industries. Mike is responsible for serving the high-performance, rich-media, video-based needs of the worlds major broadcasters, programmers, producers and aggregators of the worlds global television and media business. He was named managing director in November 2010, when the company acquired Genesis Networks, where he had previously served as the companys president and chief executive officer. Mr. Antonovich brings more than 30 years of broadcast and satellite industry sales, marketing, operations and executive experience to his position. Prior to joining Genesis Networks, he was president and chief executive officer of The SPACECONNECTION Inc., a wholly owned subsidiary of Telesat Canada, and the industrys largest bandwidth reseller of satellite capacity. Before that, he was executive vice president, Global Sales and Marketing, and corporate officer of PanAmSat, the worlds first privately-owned satellite system and leader in the development of global television contribution and distribution solutions via satellite. He also served ten years in a variety of broadcast operations and satellite engineering positions with the ESPN sports network and with Group W Satellite Communications. Yen-Wu Chen is the Vice President of Asian Operations at Integral Systems, Inc. of Columbia, Maryland U.S.A. He is responsible for developing Integral Systems Asian business. Mr. Chen has more than 30 years IT experience and has worked at Integral Systems for over 20 years. He can be reached at yen@integ.com. 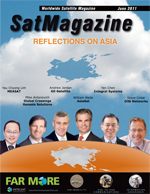 Yau Chyong Lim is Senior Director of Sales and Marketing at MEASAT, an emerging market satellite operator. MEASAT operates a fleet of C- / Ku-Band satellites that provide a range of satellite services to broadcasters, DTH platforms and telecom operators across Asia, the Middle East and Africa. The events of the afternoon of March 11, 2011, will remain in the hearts and minds of people everywhere for a long time. The earthquake, which registered 9.1 on the Richter scale, set in motion a turn of events that resulted in a 10 meter tsunami hitting the shores of Sendai in the Myagi Prefecture of Japan which, in turn, caused a nuclear disaster at the Fukushima power plant. Currently, more than 27,000 people are dead or missing. Infrastructure in the northeastern part of Japan has been completely destroyed, and the road to recovery is set to be long and hard for the Japanese people. Mr. Collar joined O3b as CEO in February 2011. He joined from SES, where he served as SVP of Business and Market Development for SES WORLD SKIES and was charged with expanding the satellite and service portfolio, including the design of new spacecraft and products. He oversaw the companys long-range strategic planning activities, M&A, global development activities and was instrumental in SES investment in O3b Networks. Steve originally joined satellite start-up New Skies Satellites (now SES WORLD SKIES) in 1999, where he designed their early satellites. He brings a wealth of experience in implementing and commercializing satellite networks from his tenure. Prior to New Skies Satellites, Mr. Collar worked at the satellite manufacturer Astrium for eight years in a variety of roles, including Payload Architect and Payload Program Manager. Satellite continues to play a critical role in addressing Pacific Islands communication needs. With the growing demand for basic voice and data applications to remote Pacific Island communities and atolls, where terrestrial communication is often not possible, communication over satellite is becoming the only solution. We had the opportunity to discuss recent satellite industry trends with Mr. Steffen Holzt, the Executive Director of Pactel International, a leading satellite communication provider in the Pacific Islands. Indias insatiable appetite for content and connectivity is nothing short of amazing.And SES WORLD SKIES satellites are enabling operators to deliver DTH, mobile connectivity and corporate networks in unprecedented numbers and in record time. Asia Pacific is a fascinating telecoms landscape. The region is renowned for having the highest GSM subscriptions in the world with an average annual growth of 30 percent. Currently, there are over 2 billion mobile phone subscribers in Asia Pacific accounting for about 46 percent of global subscriptions, the majority of which originate from China with over 710 million subscribers. Research predictions forecast that the regions consumer spending on communications will reach US$815 billion by 2015 amounting to approximately 3.1 billion users. In its struggle to regain its position as the leader of the maritime broadband market, Inmarsat has introduced Global Xpress now taking a second high-risk step forward through its acquisition of Ship Equip AS, the second largest supplier of VSAT to the worlds shipping industry. With the acquisition, it adds significant momentum in its attempt to thwart the onslaught of competitors that have threatened its future. Scientists are using the innovative Radio Aurora Explorer satellite to discover conditions that cause disruptions in space-based communication and navigation signals. Space weather-based disturbances in the Earths upper atmosphere cause disruptions that affect space-based communication and navigation signals, such as GPS and radio signals. Radio Aurora Explorer (RAX) is a space weather research satellite that is designed to investigate the causes of these weather disturbances. The photo below shows an NSF-funded ISR radar in Resolute Bay, Nunavut, Canada, which is similar to the ISR used in this study. An ISR is a tool used for upper atmospheric and space physics research that takes measurements of the Earths upper atmospheric and space regions from 60 km up to 1000 km. The ISR takes measurements such as; ionospheric electron density, ion composition, plasma temperatures and electric fields. The challenge is to deliver a real-time, reliable wireless monitoring solution, while reducing the expenses associated with using traditional, auto-dialers to mitigate risk to wastewater management companies. The solution encompassed M2M Data Corporations Aquavx wireless remote-monitoring solution, powered by the KORE network for superior coverage, data speeds and connectivity. By deploying this cellular-based monitoring solution, East Richland County in South Carolina achieved real-time access to data, ensuring waste water systems are operating properly; obtained more detailed information than available using traditional landline-based auto-dialing systems; garnered increased efficiency and lower costs; and obtained greater early warning detection capabilities. A Case In Point: Launching Bharti Airtel Into DTH, by Thomas C. Coyle, Senior Vice President + General Manager, Globecomm Systems Inc.
India may be the hottest direct-to-home (DTH) television market in the world. At the end of 2007, there were fewer than 5 million DTH subscribers in India, a tiny percentage of the nations 112 million TV households. Forecasters expect that will expand to between 25 and 30 million by 2015, and incumbents are seeing +50 percent quarterly growth in subscribers, driven by strong competition among multiple players. India is one of the most competitive markets in the world, where subscribers pay the equivalent of US$10 for a vast bouquet of channels and volume is the key to profitability. Dr. Sean Faulkner is a 25 plus year veteran in the wireless and satellite communications market. He began his career with service as a Canadian Air Force officer working in satellite communications electronic research and later in flight test instrumentation and telemetry systems. After his service in the military, Sean worked at Vistar as part of the team that delivered the GlobalWave trailer tracking products. His team also developed the mobile data communication terminal which was the basis of the U.S. DoD Movement Tracking System (MTS) and Blue Force Tracking (BFT) services over the past decade. After Vistar was acquired by TransCore and became the GlobalWave business, Sean was the vice president responsible for software and systems engineering including network operations and customer service for retail operations with over 600 firms in the U.S. trucking market. After SkyWave acquired the GlobalWave business, Sean took his current position as the vice president responsible for the technical development and commercial preparations for delivery of SkyWave and Inmarsats newest global satellite data service for machine-to-machine (M2M) applications. Called IsatData Pro and slated for introduction later in Q3 2011, this service promises to open up new opportunities for M2M providers looking to send more data, more quickly from anywhere in the world. Satellite manufacturers need to monitor the transport of very delicate objects and parts, and whenever they move satellites they need to record the shocks that they are subjected to  or else risk launching an unknown quantity. When satellites are safely floating around the weightless realm of space there is little to affect their reliability, which is just as well given the complications involved with repairing them. The most critical period affecting the reliability of satellites is thus the dangerous part of their lifecycles where gravity and its associated effects conspire to render these frighteningly expensive and fragile objects into useless pieces of spacejunk. And the real nightmare comes from the fact that engineers may not know about any damage until it is too late. Space continues to capture the imagination, providing opportunities for learning, exploring, and dreaming about the future. At the same time, space systems are used for everyday purposes such as weather forecasts, driving directions, and international telephone calls. Networking of digital television content has, for a long time, suffered adverse effects caused by multiple satellite, microwave and terrestrial linksthese effects are referred to as concatenation. In legacy analog systems, demodulation and re-modulation of the signal at intermediate points in the network contributed to signal degradation, particularly signal-to-noise, which in many instances reduced the image at the point of delivery to less than that normally acceptable in broadcast television operations.